In my last post, I asked folks on both sides of the debate on the Friedrichs Supreme Court case to consider part of the moral foundation that might be driving each other’s beliefs. In this post, I will address concerns that I have about what could happen if those who are trying to undermine established state laws are successful. There are thousands of big and small decisions that must be made about our work lives; many of these decisions, the kind that affect hundreds of people, are codified in a contract or collective bargaining agreement with the district. A majority of these decisions relate to mundane aspects of our jobs which are disconnected from hot button political issues, but a few are controversial—particularly in an era of controversy over how best to support students, tight budgets, and high expectations. The plaintiffs in the Friedrichs case would have us believe that they are fighting for the “individual right” to make these kinds of decisions for themselves, but some level of collective decision making is necessary in a large bureaucracy. 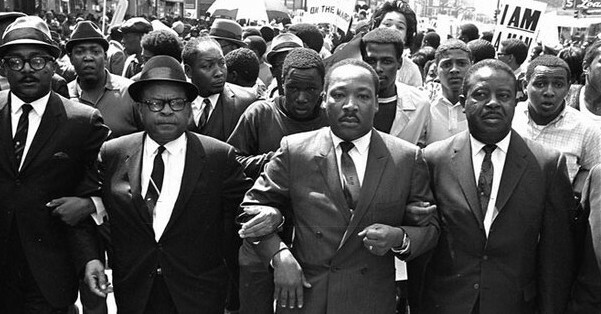 Martin Luther King’s fight for economic justice matters today. Working people are walking in his footsteps. Americans are right to remember the Rev. Martin Luther King, Jr., as a leader who was unshakably committed to the principle of nonviolence. But let’s not forget that he was a fighter. On the day he was murdered, nearly 47 years ago, King was in Memphis, Tenn., standing with black city sanitation workers who had gone on strike for higher pay, safe working conditions and the right to stick together. Martin Luther King’s last act was to stand with public service workers as they fought for a union. Growing up in a conservative household in Walla Walla, I was taught the value of hard work, earning your own way, and working to improve the lives of others. I learned that even in America, no one is promised success; we have to fight for it. These are lessons I learned from my father. Today, despite working harder than ever before, working families are finding it increasingly difficult to get by, let alone get ahead. No matter where you fall on the political spectrum, Americans can feel that our economy is out of balance. That’s why I am a proud conservative and an active member of my union, the Washington Federation of State Employees of the American Federation of State, County and Municipal Employees.By speaking up together, union members are able to negotiate with their employers for fair wages, benefits and safe workplaces that sustain American families. When more people belong to unions, middle class income rises.But these days it’s hard to ignore the wedge that some are trying to drive between conservatives and their unions. Even though a growing number of Americans support unions — including nearly half of conservative voters — some say that being conservative and a union member is a paradox. Those who failed to implement “right-to-work” laws in Minnesota now go for similar goals for public-sector workers at the federal level. Like many Minnesotans, I am a strong believer that people who work hard and follow the rules should have a fair chance to get ahead. It shouldn’t matter what part of the state you are born in, or who you know, to determine whether you are able to provide a healthy and happy life for your family. It is this core value that helps shape why hundreds of thousands of Minnesotans like myself are proud members of unions, where we come together to improve our lives and strengthen our communities. To me, being in law enforcement is about more than doing a job, it’s about being the backbone of your community. I have been in law enforcement for 16 years, as a patrolman in the New York City Police Department and, for the past 14 years, with the Norwalk Police Department. I’ve worked as a narcotics officer, a detective, SWAT operator, union treasurer and union president. I know the challenges that officers confront every day and the importance of having a strong advocate for their work conditions, health and safety — their union. It’s why I’m concerned about a court case from California that will be heard Monday by the U.S. Supreme Court and, depending on the ruling, could undercut and even disable unions representing government workers. Union members delivered more than 100,000 signatures to the Center for Individual Rights. Michael Campbell photo. A few weeks ago, I started an online petition to a group called the Center for Individual Rights — an organization backed by the Koch brothers, other right-wing 1 percenters, and even white supremacists — to tell them to stop attacking working people and our right to join a union. I wasn’t shocked when over 100,000 people signed my petition, and I wasn’t shocked at the response my brothers and sisters got from the Center for Individual Rights when they tried to deliver the petition signatures today. The same powerful interests that failed to pass right-to-work laws and constitutional amendments in Minnesota and other states are now trying their luck at the U.S. Supreme Court in the case Friedrichs vs. California Teachers Association. Oral arguments are Monday. The justices will rule later this year. Before and after, pundits will fill newspapers and airwaves with predictions of what the case will mean for American labor. We’re not those pundits. We’re three public employees, ordinary members of the unions the Fredrichs plaintiffs want to destroy. We worry what that would mean for the public we serve. The United States Supreme Court will soon hear oral arguments in Friedrichs v. California Teachers Association (CTA), a lawsuit with major implications for the future of organized labor. While it purports to be about free speech rights, Friedrichsis actually a deceptive attack on unions. Many California public school teachers working in traditional school districts are CTA members by default. CTA collects dues from members, some of which are “chargeable” — that is, applied to the costs of collective bargaining and classified as apolitical — and the rest of which are “nonchargeable,” or classified as political. The U.S. Supreme Court will hear arguments in mid-January in a case that could have big ramifications for public-sector unions in Washington state. It’s called Friedrichs v. California Teachers Association, and the case concerns whether it’s okay that states such as California and Washington require public-sector employees to pay their union an “agency fee” for the cost of collective bargaining even if those workers opt out of paying the full amount of dues because they don’t want their money to go toward the union’s political activities. It’s already too difficult for too many Americans to get by, let alone get ahead. Unfortunately, Black folks, who face an unemployment rate nearly twice that of the national average and median family incomes approximately 40 percent lower than whites, know these challenges all too well. For Black women, all of this is compounded by gender discrimination in pay – Black women only earn 64 cents on the dollar for doing the same work as men – that is far worse than the average for all women, itself an unacceptable 78 cents on the dollar. Working people and their livelihoods have been under assault for decades thanks to an economy thrown further and further out of balance by wealthy and powerful special interests that manipulate the rules to further enrich themselves at the expense of the rest of us. Meanwhile, we continue to struggle, to say the least, with the effects of systemic racism.